Emerald Ash Borer; Coming to an Ash tree near you! Insects and diseases have been affecting various tree species for centuries: both occur naturally and keep our trees healthy. However, when invasive species are introduced into the lifecycle, the results can become detrimental to our forests. The Emerald Ash Borer (Agrilus Planipennis), or EAB, is a wood-boring insect originally from Asia and was first detected in Michigan and Southwest Ontario in 2002. It is suspected that this invasive insect was accidently transported to Canada in wood packaging material used on shipping containers. EAB has since spread throughout Ontario, into Quebec, and has recently been detected in Edmundston, New Brunswick (May 17, 2018). Map showing the current North American distribution of the Emerald Ash Borer from the Cooperative Emerald Ash Borer project. Map last updated on July 2, 2018. How does EAB kill trees? EAB attacks only true ash trees, including green, white and black ash and targets trees of all sizes. The beetles feed on ash trees in Asia too, but those trees have developed natural defenses due to co-evolved with the insects. EAB begin to destroy ash trees by laying eggs between the crevices of the bark. Once the eggs hatch, the larvae will bore into the tree and chew through the bark, and feed on the phloem and cambium layers, interrupting the flow of nutrients and water that is needed for the trees survival. After overwintering in the tree, the EAB adults (approximately 10 mm in length, no longer than a grain of rice, and metallic green-blue bodies) will emerge in the spring, leaving small, 1/8-inch, diameter D-shape exit holes. This life cycle creates stress on the trees, causing thinning leaves, die-back in the tree’s canopy and bark loss. Why should I care? Ash trees do not only play an important role along our riparian zones but have been widely planted in our urban forests. Urban forestry plays a major role in reducing storm runoff, urban noise, providing shade and cooling, and filtering pollutants. Ash trees can often be seen planted along city streets due to their tolerance to urban environments. Until now, ash trees had very few diseases or problems with pests. As the spread of the EAB continues east across Canada, ash trees in New Brunswick are at risk of becoming infested with the invasive species, killing thousands of street trees in the province. Watch out! Since its discovery in Edmundston, it is only a matter of time before EAB is detected in Saint John. During a 2017 street tree inventory of the Central Peninsula, it was found that 14.1% of street tree species were true ash species. Once the emerald ash borer finds it way to Saint John, ash trees, both in the rural and urban environments, will be lost due this invasive species. Green and white ash trees found along the streets of the central peninsula surveyed during a street tree inventory (2017). What can I do? It’s crucial that we educate the public about the long-term effects of EAB and how we can work together to be ready for the invasion of these pests. 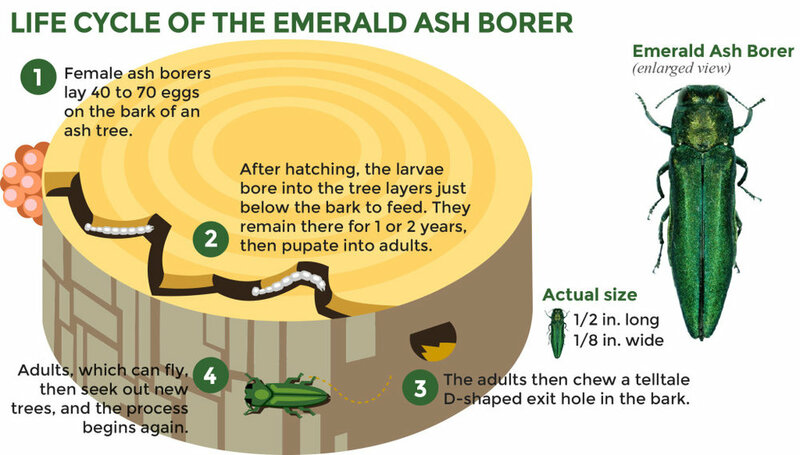 The Emerald Ash Borer is most commonly spread through the movement of firewood and other infested ash wood products. If you transport infested wood you could be helping spread this invasive species across the country. Help prevent the spread of these pests by buying firewood where you will be burning it. If you happen to have an ash tree on your property, consider planting new trees to replace lost canopy. Great native, deciduous trees to choose from include Bur oak, Red oak, American linden and Sugar maple. Planting a tree on your property is an important step in making our urban forest healthier in the future. Learn how to identify EAB, as well as their signs and symptoms they leave behind. Check out Natural Resources Canada to find out more information. Buy local. Don’t move your firewood. Did you know that invasive species are the second biggest threat to biodiversity after habitat loss? Do you ever wonder how some of our invasive species initially arrived to New Brunswick? Alien species can arrive in several ways, including ships, vehicles, machinery, humans and the dispersal via wildlife, wind and water from nearby infested areas. Some species were accidently introduced through ballast water on ships (i.e. zebra mussels, European green crab), while others were intentionally introduced due to benefit humans without knowing that the species would become invasive (i.e. rock pigeons, Japanese knotweed). Invasive species can thrive in their new environments because they have very few or no natural predators or other elements that would normally keep them in check. These new introduced species have the ability to outcompete our native species for resources (habitat, food and shelter). In just a short time, invasive species can spread across the country if they are not controlled. Last week, we got a phone call from a local school concerned about the amount of goldfish that can be found in their campus storm water pond. It's thought that students have been dumping their unwanted pets into this waterbody for years when they leave for summer vacation/graduation. You might be asking yourself: what is so harmful about a few goldfish in a natural environment? The answer is: everything. Goldfish are becoming one of the worst invasive aquatic species in the world. These fish are able to tolerate changes in water temperature, as well as water with low levels of dissolved oxygen, and will primarily feed on fish eggs, larvae and aquatic plants – outcompeting our native aquatic species. Goldfish can grow quickly and up to 40 cm in length! We teamed up with the students from the school to collect as many goldfish as we could out of the pond, and to educate them on the dangers of invasive species. The students suited up in waders, grabbed nets, and began corralling fish. Students waist deep in the stormwater pond on school property trying to capture introduced goldfish. Despite the rain, the students had a great time catching fish. It was even some of the students first time in chest waders – which is a whole different experience in itself. With the help of spectators, students were able to catch almost 25 goldfish! After speaking to some of the teachers from the school, I was informed that there were approximately 80+ goldfish living in this pond. Although the students were not able to catch all the fish, it was thought that this could a be a fun, recurring activity in the future for the students until all the fish are gone. Some of the goldfish that were caught using using handheld nets. One of the main questions I received during this workshop was: “what will you be doing with these fish when we go back to class?”. When I was first asked to lead this workshop, I didn’t really have a plan, as I didn’t have a tank at the office or at home to put the fish in. I decided to call one of our local pet supply stores to see if they would be interested in adopting the goldfish that had been collected. Without hesitation, they told me to bring them over and they would find them a new home. Ask a family member/friend if they are interested in adopting your fish – many people have fish tanks in their home and may gladly take these critters off your hands. Call your local aquarium – as long as the goldfish haven't grown to 40 cm in length, these facilities will usually take your unwanted pet (as it can be seen as free merchandise for them). Goldfish being introduced to their new aquarium home.